November 30th, 2007: Sunny and Cold, Water Temp 50* and Clear. 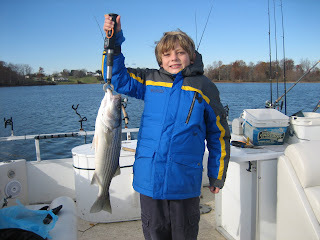 We had a group of 7 anglers today from Blue Ridge School so we split the guys up between my boat and John's boat. John took the Pomunky side of the lake and I went up the Anna Side. 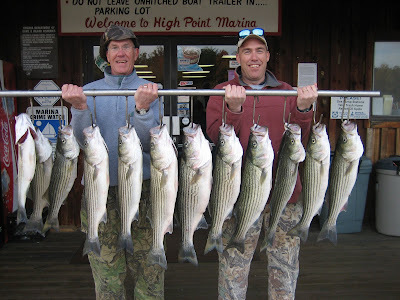 John caught Herring this morning and ran them on Planner boards and I had big Gizzards and ran them on Boards also. 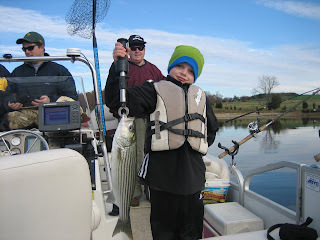 We got a few bites early then had a spell of 4 hours without putting a fish in the boat and then toward the end of the trip caught 5 in 20 minutes, catching 12 fish on Gizz today. 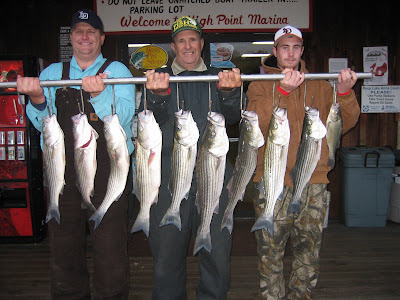 John had hits consistantly all day and ended up catching over 20 Stripers today. 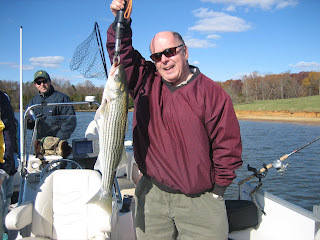 Although the big fish did not feed today everyone ended up having action and taking fish home. November 23rd, 2007 : Sunny and cold, Water temp 55* and clear. Picked clients up at 8 am at their dock and went directly to a bay that was out of the wind. A cold front blew through last night and I wanted to keep the kids as comfortable as possible in the cold and wind today so I caught bait before I picked them up. Put out 10 planner boards and a bobber and stayed in the protected bay this morning getting strikes about once every 30 minutes on Gizzard Shad. Although it was bitter cold for the kids they hung in there and did very well. 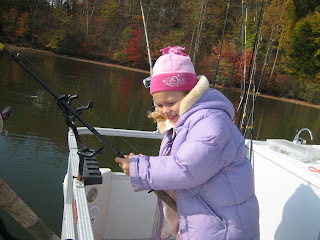 We only fished a half a day this morning but everyone caught nice fish and released all of them to fight another day. I am sure Bob has alot to be thankful for having these great fisherman in his family and spending time in the outdoors on a Thankgiving weekend on Lake Anna. November 21st. 2007 : Sunny and warm, Water temp 54* and clear. Caught bait and started pulling flats from 14 to 5 feet of water and just as we put the last planner board out we hooked up with our first fish. We had 4 strikes pretty fast in the mouth of a little creek . 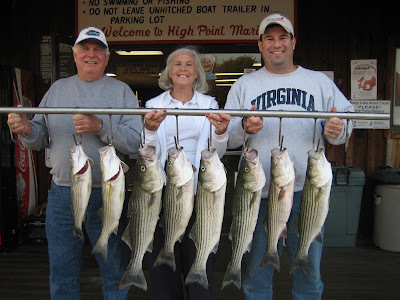 We continued to run the points and humps with the fish being lethargic and not wanting to eat our offerings. After getting 12 to 15 hits without hooking up I decided to relocate to another part of the lake over 20 feet of water and got bit right away but pulled another mile with no more strikes. Finally hit one little stretch where the fish would strike and for the next 2 hours we had action every 10 minutes or so. 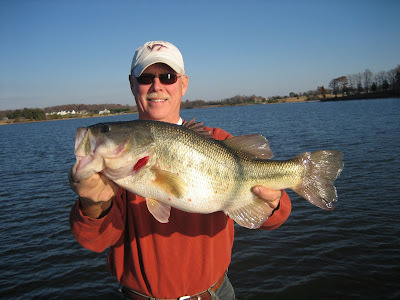 Craig's parents are up from Florida and enjoyed a very pleasant day on the lake with their son. Craig took a nap at one point and woke up to the drag going off and thought he was eating a Cheeseburger in Paradise. November 12th, 2007 : Sunny and Pleasant, Water temp 56* and clear. Picked clients up at 6am and went and caught bait. 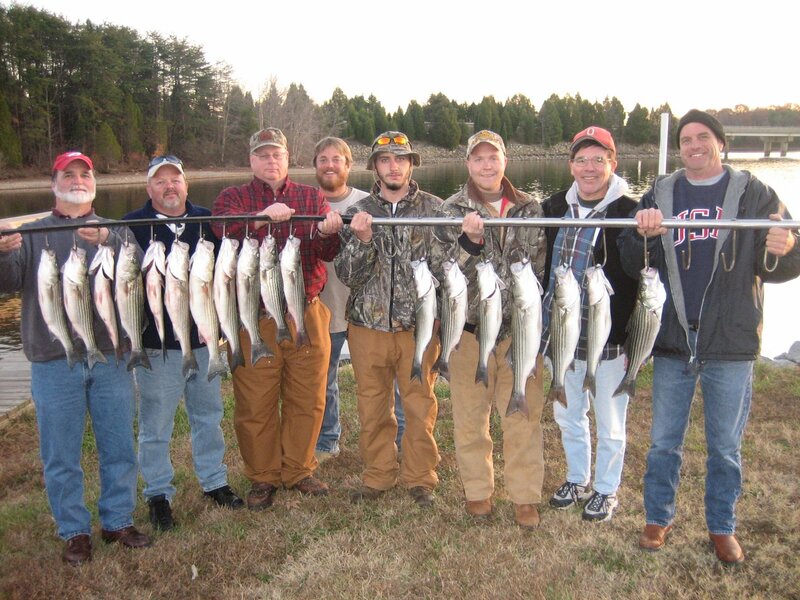 Set up planner boards rigged with Gizzard Shad and ran points and flats in 10 to 15 foot of water. 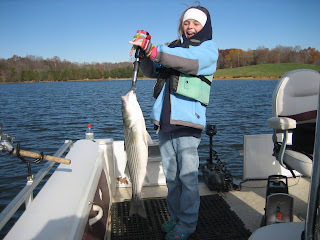 Got hit on the first point and Kris put the first Striper in the boat. 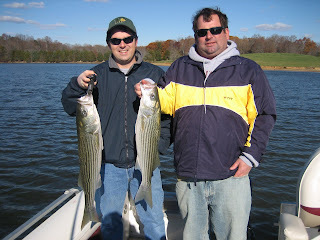 We hit the same point again and caught another fish the same size. Fished for another 45 minutes without putting a fish in the boat then hit a flat that produced a couple of fish. Pulled down to a flat with a couple of boulders on it and hooked up with a double. Overall it was a beautiful warm fall day with enough action to keep everyone on their toes. 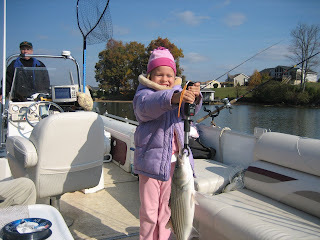 6 year old Alina is pictured reeling in here first Striper, completely without help from anyone. 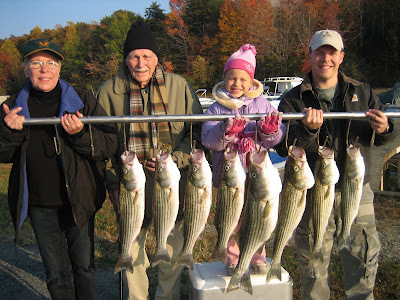 Also pictured is her Great Granddad who is 91 years old who also reeled in a couple of fish today without help. Nothing better than the outdoors to bond the young and old. [Dad was a very proud father, son and grandson today also].